The Sony Xperia Z3 first appeared last week, and with it two more devices, the Xperia Z3 Compact and the Xperia Z3 Compact Tablet. How does the Z3 compare to the Z3 Compact? Is one superior to the other? 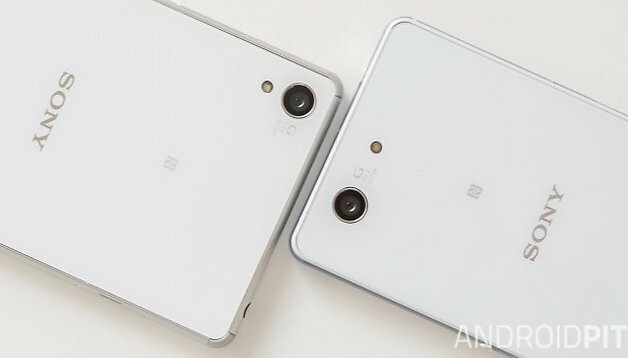 While Sony sells the 4.6 inch Compact as ''a compact smartphone with uncompromised performance’’, let’s take a closer look at the differences and similarities. The Z3 Compact, though it’s intended to be the smaller brother of the Z3, has a few differences in terms of design: when holding either device in either hand, the Z3 gives us a more premium feel, which is likely due to the choice of materials. The Z3 comes with an aluminium frame, while the Z3 Compact housed in plastic. This is a bit of a shame, like we said when the HTC One Mini came with a plastic frame instead of full-on metal like the HTC One. With its latest devices, Sony implemented rounded bumper edges to the Z3, Z3 Compact, and Z3 Compact Tablet, a precautionary measure in case the device falls. That being said, the ones on the Z3 Compact protrude more than on the Z3, and this, combined with the bulky plastic frame which sticks out slightly, makes it appear a lot thicker, This is disappointing because otherwise the Z3 Compact looks really nice, and those who opt for a smaller size will also have to opt for plastic and thicker design. The Z1 Compact seemed more refined here as well, which we also show in our Z1 Compact vs Z3 Compact comparison. Other than this one feature, the Z3 Compact and Z3 are very similar, with the same front and back panes of glass, precise angles, and OmniBalance design. The main difference observed between these two Sony smartphones arise in this section: the screen diagonal is obviously reduced for the compact handset, with the larger measuring 5.2-inches while the smaller 4.6-inches. The difference of 100 ppi can’t really be seen by the naked eye. In terms of brightness and color reproduction, both handsets offer a great viewing experience: the viewing angles are excellent, colors have rich contrasts, the blacks are actually black. Also, both allow you to adapt the screen settings as you’d like them. The Z3 and the Z3 Compact have the same software, though the icons on the Z3 are slightly bigger, and the setup slightly adjusted for the bigger screen size, but other than that, it’s pretty much the same. Applications and functions of the Xperia UI, as well as Android 4.4.4 KitKat, are present on both devices. This is where the Sony Compact shows where it has the upper hand: under the hood, you’ll find tech specs which are characteristic of ‘’bigger’’ flagship models, as opposed to HTC and Samsung which stock their mini devices with mid-range hardware. So this is a great change. Just like in the Z3, the Z3 Compact has a Snapdragon 801 processor, clocked at 2.5 Ghz. The Z3 Compact has ‘’just’’ 2 GB of RAM, while the Z3 has 3 GB. While the difference of performance between the two can’t really be noticed most of the time, we did observe that starting the camera and taking a shot was quicker with the Z3 than its little brother, but this of course by only a few nit-picky milliseconds. Sony brought the same camera functionality to both handsets, with a 20.7 MP at the rear, and 2.2 MP on the front. As mentioned above, taking pictures with the Z3 was slightly more fluid than with the Z3 Compact. Both offer a physical camera button, which is particularly useful for underwater pictures, or taking a selfie! The 2,600 mAh battery in the Xperia Z3 Compact is sufficient in order to provide the device with long battery life, though the capacity found in the Z3 battery is obviously superior. We can’t tell you much more about how strong the batter life is in practice, but we’ll share our findings once we do a more elaborate battery test. That being said, Sony promises 2 days of battery life on both devices! Sony is one of the very few that have answered to the prayers of many Android users: providing a phone which measure less than 5 inches that still has the power and performance you’d expect from a flagship, for the most part at least. In comparison to the Z3, the screen definition, RAM and battery aren’t up the same level. If a larger device doesn’t bother you, then you should turn to the Z3, which will be around 150 bucks more. But for lovers of smaller phones, you should consider the Z3 Compact before any other mini handsets from other manufacturers. Which of the two do you prefer? Let us know in the comments below!